Part 2: Yvonne Ng on the “Activists’ Guide to Archiving Video” | Democracy Now! senior archivist for WITNESS, which trains and supports people using video in their fight for human rights. 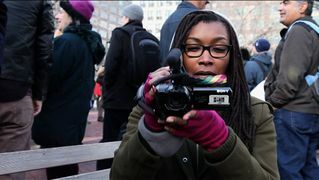 She co-authored “Activists’ Guide to Archiving Video,” which is available in English and Spanish and Arabic. JUAN GONZÁLEZ: Well, we continue our conversation on the growing number of people filming police abuse on their smartphones and with video cameras. Yvonne Ng is the senior archivist for WITNESS, which trains and supports people using video in their fight for human rights. She co-authored their “Activists’ Guide to Archiving Video,” which is available in English and Spanish and Arabic, after hearing from activists that this was a skill set that they were largely missing. YVONNE NG: Thank you for having me. AMY GOODMAN: So, before we talk about archiving, how people should actually film when they want to document something? YVONNE NG: Yeah, so, a few tips that I can share is, well, first of all, be prepared. So bring extra memory cards and extra batteries with you. So, if you’re filming an incident and you’re afraid that footage might be confiscated from you, you want to swap out those cards and preferably work in pairs or in teams, so you can hand off those cards to somebody else. The second thing is to, when you’re filming, document landmarks that are notable or street signs, and this makes it easier for people to verify and identify your video later on. So we’ve seen this, for example, in Syria, where activists are using mosques as ways to identify where certain undocumented footage is taking place and so that they can map where things are happening. YVONNE NG: Yeah, so there actually are a number of live-streaming services, and they’re all kind of similar. One important thing to note with the live streaming is that often they have options for recording your session or keeping a copy of your session that you can download afterwards. And that’s important to do, because you don’t want just a copy of your live stream to stay on this site that often you have no control over. You want to have a copy yourself, so that you can preserve it, so that it can be used later, so it can be viewed by more than just the people who happened to be tuning in during that one moment that you were filming. AMY GOODMAN: We have another question someone sent in on Facebook from Guari Adelkar, who asked, “What online video/photo portals/apps, that won’t strip us of our privacy of course, do you recommend to make an actual difference, both in terms of the number of people who can see it, and to catalyze legal action against injustice?” I’m assuming what this person means is how can it not be traced back to them, but they want to post it. YVONNE NG: Well, it’s important, with whatever service you choose, to know what information that site makes available to others, whether that’s through some kind of back end or whether that’s just to the general public. So, YouTube, for example, like, you can—there is a face-blurring tool, so you can blur faces. If you upload videos, you can make private or unlisted videos. But YouTube, there is a lot of data about the video that you can access via, let’s say, its API or just, you know, on the interface. So, to protect privacy, you just have to be aware of what the different services expose. YVONNE NG: It’s not that if you don’t have the original video or that if you’ve edited, it’s not usable at all. But by keeping the original footage unaltered, unedited, in its original format, you’re sort of increasing the chances that it can be used, because it can be shown to be authentic. You know, editing a video, people don’t know what was taken out and why you took it out. So, you know, it’s not that it can’t be used, but you want to keep at least a copy of the raw footage, if somebody wants to see it later on. AMY GOODMAN: You said actually two copies. You want to keep a copy of the raw footage on two different hard drives or in a computer and give to someone else. YVONNE NG: Yeah, and when you edit a video, like you were mentioning before, you’re creating a new video, so that original metadata that’s part of your original file is not going to be in your new video. So you can share an edited version of the video. Let’s say you need, for privacy reasons, to blur someone’s face or to take out some sensitive information, but keep a copy of your original. JUAN GONZÁLEZ: I’m wondering if you could sort of assess the impact of these citizen videos. It’s only been 25 years. I remember when I interviewed the guy who did the Rodney King video back in 1992. He was an Argentinian businessman who just happened to be in his apartment. He had just gotten a video camera as a birthday present the day before. And when he heard the commotion outside his window, he took out the camera from the box, used it for the first time to film the Rodney King video. And now we’ve had, in 25 years, this explosion of citizen video. YVONNE NG: Yeah. And it’s interesting. The Rodney King video was actually shot on videotape, which in some ways is actually a lot easier to manage than the digital files that activists are creating now, because with a videotape, you can put it on a shelf for a little while, at least, before you have to digitize it to preserve it. But, you know, the digital files that activists are creating now are fragile, sort of from the moment that they’re created. And that’s why archiving is relevant now to activists who are shooting video. It’s not really just an afterthought. But to your question about, you know, what difference archiving videos make, one example that I can give is, the Congolese warlord, Thomas Lubanga, was on trial at the International Criminal Court. He was the first person that that court was able to sentence. And video was used before and during his trial to prove that he conscripted child soldiers. There was video of him talking to children at military camps. There was footage of him using children as their bodyguards. And so, the crimes that he was convicted of happened from 2002 to 2003. He wasn’t arrested until 2006. And then his trial took another six years after that. So, that video had to be available and preserved for at least 10 years to be used in the case. And even beyond that 10 years, you know, now those videos are part of the historical document. They’re how we understand what happened. They’re part of the official record. So, that is like the impact of these videos. It goes much beyond its sort of initial upload or use to just get that information out there. It really has a long-term value. AMY GOODMAN: —and practices that are going on here. WITNESS, too, is known as an organization that provides video cameras for people around the world to document the abuses of dictators and their militaries. AMY GOODMAN: And yet you’re working now with people here in the United States. YVONNE NG: Yeah. I mean, we work all around the world, and that’s where we’ve learned a lot of the knowledge that we have, that we are able to share in our resources. And one of the important things that we know is that the local communities understand their context best. So the way that we’ve produced our resources are so that they can be easily downloaded for free, they can be customized to local needs, and they can be republished by local organizations. And we also rely a lot on local expertise. So, you know, rather than producing some resources ourselves, we depend—we point activists to local expertise. For example, the ACLU has great resources on, like, your rights to film during a protest. AMY GOODMAN: Well, I want to thank you very much, Yvonne Ng, for joining us, senior archivist for WITNESS, which trains and supports people using video in their fight for human rights, co-author of the “Activists’ Guide to Archiving Video.” It’s available in English, in Spanish, in Arabic. And we’ll link to it at our website. I also want to say special thanks to Democracy Now! 's own archivist, Brendan Allen, who first brought the “Activists' Guide to Archiving Video” to our attention. Our records stretch from the early '80s to today and include interviews, oral histories, field recordings and footage of people and histories that often go undocumented. The archives are an integral part of our show. We use material from them almost daily. So, thanks so much, Brendan, and thanks to all of you who make Democracy Now! possible. I'm Amy Goodman, with Juan González.